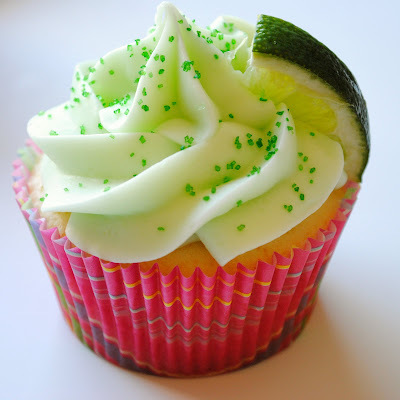 Here's a fun recipe for margarita cupcakes that can be made super quickly thanks to the help of a box of cake mix. 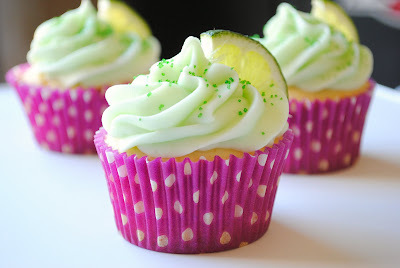 The addition of margarita mix, lime zest and a fantastic cream cheese frosting makes them special. These are perfect for a Cinco de Mayo party, a great dessert for a Mexican themed dinner party, or fun for an adult party like a couple's shower or summer barbeque. Preheat oven to 350 degrees and line 24 muffin tins with paper liners or spray with baking spray. Mix together margarita mix, tequila and orange juice in a large measuring cup. Add cake mix to mixing bowl and add egge whites, oil, lime zest and tequila mix. Beat on low speed for about 30 seconds until dry ingredients are incorporated and then beat on medium high speed for 2 minutes. Spoon batter evenly into muffin cups, filling about 2/3 of the way full. Bake for 20-25 minutes until a toothpick inserted in the center cupcake comes out clean. Cool about 5 minutes in the pan and then cool completely on wire racks. Beat cream cheese and butter on medium high speed until smooth and fluffy, about 3 minutes. Add 2 T lime juice and lime zest and beat until combined. Add powdered sugar 1 cup at a time, beating on low speed until incorporated. Add more lime juice if necessary. Add food coloring a couple drops at a time and beat on medium high speed until desired color is reached and icing is smooth. Pipe onto cooled cupcakes as desired. 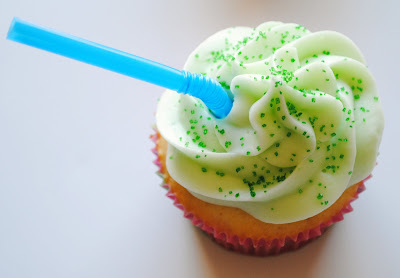 Lime wedges, straws, and sprinkles all make festive garnishes. Refrigerate cupcakes in an airtight container if not serving immediately and bring to room temperature a couple hours prior to serving. Ok wow! I am definitely making these. You are amazing! Great photos. Cutest ever! A cupcake with an alcohlic name? <3<3 The best! Thanks for sharing the recipe!! These are so cute, and you're right--perfect for cinco de mayo! I love the pic with the straw! These look fantastic, can't wait to try them! These look great and all my favorite flavors too. Will definitely have to make them. So inviting! 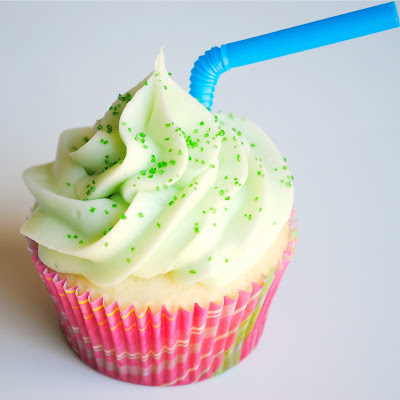 Love the lime and the straw inserted, so fitting for the cupcakes. You have no idea how happy this makes me. We just got new patio furniture and these cupcakes plus a real margarita are calling my NAME! Very nice! You have combined two of my favourite things! YUM. a fabulous treat! ur photos are awesome! Oh my goodness these look adorable! Love the little slice of lime. Definitely going on my cinco de mayo recipe list! Made these tonight. Love the icing! If I didn't want to include the tequila, what should I use in its place? I would just add a little more margarita mix or orange juice. What tip do you use to pipe the frosting like that? I LOVE YOUR CUPCAKES!!!! @Shannon Elisabeth - Thank you! I frosted these with a Wilton 1M tip -- just a large star tip. Seriously one of the best cupcakes I have ever had in my life. I brought them to work one night and my co-workers keep asking for them. Thanks! Made these this morning for a BBQ tonight... I had my doubts how tequila could taste good (My only hangover was after a night of margaritas) but I trusted the reviews, and these are sooo tasty. And I cant wait to share them with the margarita loving group! ??? the frosting is runny. what can i do to make it thicker??? Well I'm guessing I'm way too late responding to this, things were a little crazy around Thanksgiving in our house. If your frosting isn't thick enough, the best solution would probably be to add some more powdered sugar. If you think your butter was too warm when you added it, you could also try refrigerating it for a little while to firm it up and then mix it again to fluff it up. Stupid question I'm sure...but, does the alcohol cook out when baking? Just wanted to make sure I'm not making everyone drunk and who I can serve these to? For the most part - yes, the alcohol bakes out of the cupcakes and you are just left with the flavor. You don't have to worry about anyone getting drunk off of a cupcake. Now whether you give them to kids or not is your call. First off, SUPER cute! Can't wait to make these for Cinco de Mayo in a couple of days. Question: did you use liquid margarita mix or the frozen kind? Thank you! I used the liquid margarita mix - like the Mrs. T's mix or whatever your preferred brand is. also love the theme/design), I don't have time to go through it all at the moment but I have book-marked it and also added your RSS feeds, so when I have time I will be back to read a great deal more, Please do keep up the excellent work. I run a fundraiser every year and at this year it happens to fall on Cindo de Mayo. These cupcakes will be perfect!! Thank you! Just made these..look awesome! Instead of OJ I used a little grand mariner and sunny d.. For the icing I also added grand mariner and used the juice of 3 limes and the zest from 2 and added an extra block of light cream cheese! Yummy.. I also did not use the green coloring in the icing, I dyed some sugar crystals green and rolled the sides of the cupcakes in that!